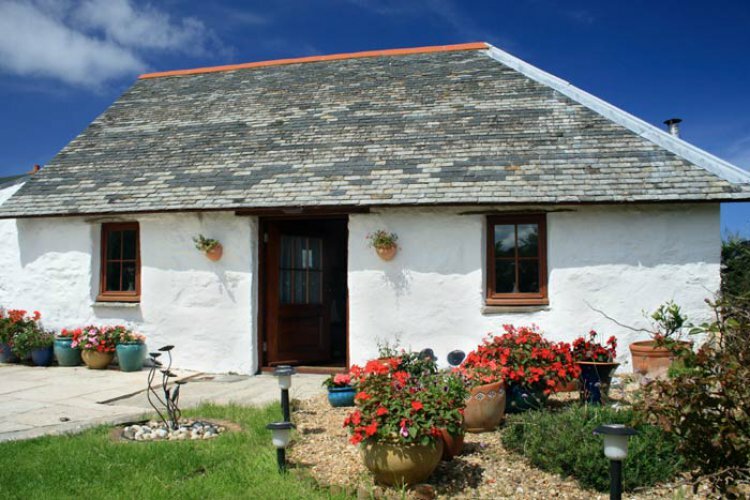 'The Bowjy' near Hayle in Cornwall is a delightfully converted detached barn with a large private garden that was originally a cowshed (Bowjy is literally ‘cowshed’ in Cornish!). Sleeping two people in comfort, the quality of the conversion is apparent from the moment you enter. Exposed stone walls, vaulted ceiling, central heating and a wood burner all come together to offer an ‘all mod cons’ property with all the character of a traditional barn. Entered through the side gate from the parking area (shared with the owner's house) into the large private garden and patio area. The front door leads straight into the large open- plan living dining and kitchen area. The lounge has a comfy three-seater sofa, foot stool, LCD TV with DVD and freeview built-in and a wood burning stove with your first basket of logs included (more supplies available locally). The kitchen has good quality units and is very well-equipped with washing machine, fridge, freezer, electric oven and ceramic hob with extractor over and a microwave. There is also a dining table and four chairs. The en suite double bedroom has a 4'6" double bed with bedside tables and lamps, chest of drawers and a double wardrobe also with further drawer space. The en suite shower room has a large shower cubicle with electric shower, matching toilet and contemporary handbasin with light and shaver point over and a heated towel rail. Outside is the large garden with culinary herbs, patio and patio furniture and off-road parking for one vehicle. The coastal path is approximately two miles away and the lovely beach at Godrevy is about 3.5 miles away. The Bowjy and the owners' house stand in open countryside, surrounded by farmland. Rental includes bedlinen, towels, electricity, heating and first basket of logs. We regret there is no smoking inside The Bowjy.